It’s Sunday, the day our small group of bloggers puts up our latest meals made using mostly local ingredients, bought from farms and artisans in our 100 mile radius. As for the farm reports, which I am working also, I hope to do at least two farms a week, and make them part of my Eat Local Challenge. They will be spaced out to take advantage of visits once they open for the spring and summer seasons. Tomorrow I will talk about Clark’s and later this week, Breezy Willow. Clark’s just opened their Elioak site last week, and I stopped by today to see how they were doing. Busy, busy, busy. As I said, more tomorrow, but how can you resist such a beautiful scene? Today I want to showcase some local foods from my Breezy Willow Early Bird CSA, which found their way into dinners the past two nights. And, since wineries are farms, too, I will touch on the wines from VA that made their way to the table. 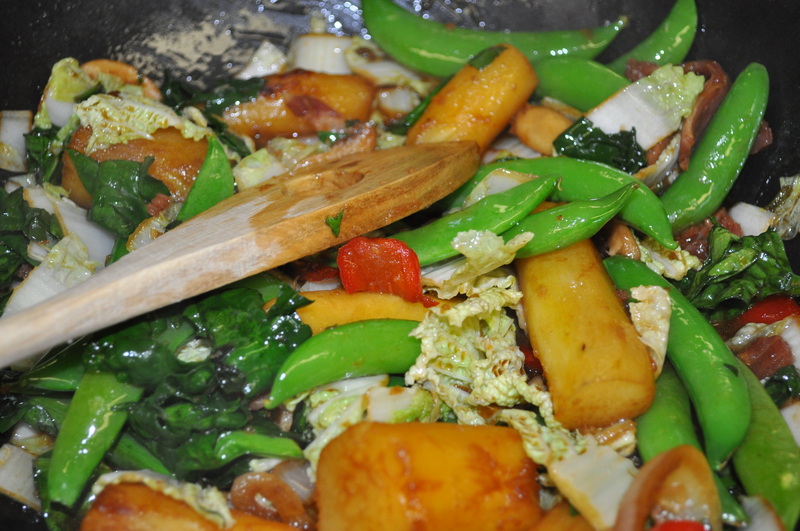 The Napa cabbage, sugar snap peas, mushrooms, onions and spinach all came from Breezy Willow. The Canadian bacon in there came from Orchard Breeze Farm in PA, bought at the Olney indoor winter market. Orchard Breeze raises Berkshire hogs. This bacon made its way into many meals the past few days. The Japanese sweet potatoes that you see in the pan came from my fall CSA, Sandy Spring, which uses Lancaster Farm Fresh Coop, a nonprofit Amish coop from PA (80+ farms). I divide my CSAs between the two, using the strength of each one to keep me in fresh foods most of the year. Looks good, doesn’t it? 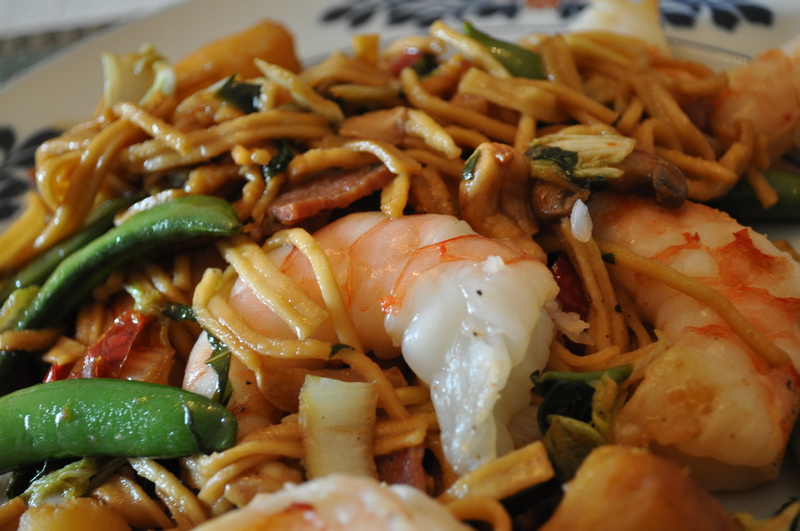 The shrimp came from the new Harris Teeter in Marriottsville, and the noodles are from Nature’s Yoke. I picked them up in the farm store at Breezy Willow when I got my CSA. Served with one of my favorite wines for slightly spicy dishes. Since this dish also included some of the red peppers from the olive bar at Harris Teeter, some garlic from last week’s CSA, and grated ginger (another Harris Teeter purchase), it had a little kick to it. 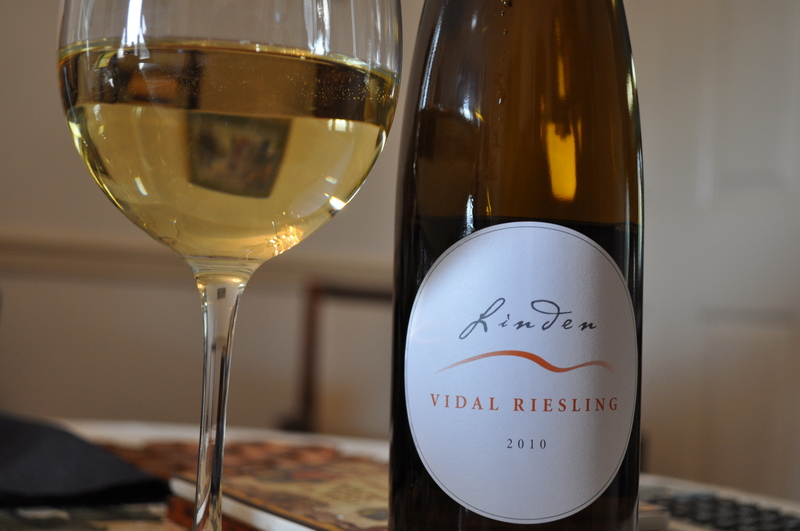 Enter Linden Vidal Riesling, a slightly sweet yet acid balanced white perfect for Asian styled foods. I include Linden and his wines in my farm categories, as if you ever meet the owner of Linden, Jim Law, he will introduce himself as a farmer. To him, growing the grapes and tending his land is extremely important in the success of his winery. Last night we had another local meal. Venison tenderloin. From my stash of venison. The farm across the way from us. My neighbor helps them in herd management and we got one of them for the cost of processing. 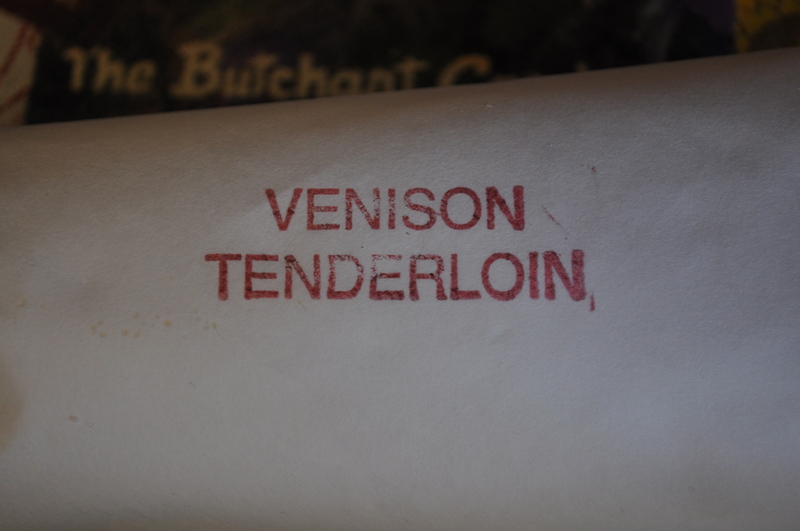 This was the tenderloin, a prized part and one that demands careful handling. I did a dry rub with RubJoeMeat. I can’t explain it. Read it on their web site if you really want to know. Trust me, though, it is a great rub for beef and for venison. I found the recipe to use for the tenderloin here. I did not use a BBQ sauce, I made my own sauce from my berry vinaigrette, local PA maple syrup, balsamic, cinnamon and cayenne. Grilled it on that lovely evening yesterday. The sweet potato is from last week’s CSA. The salad made with eggs, spinach, mushrooms, onions, all from Breezy Willow, the last of the bacon from Orchard Breeze. 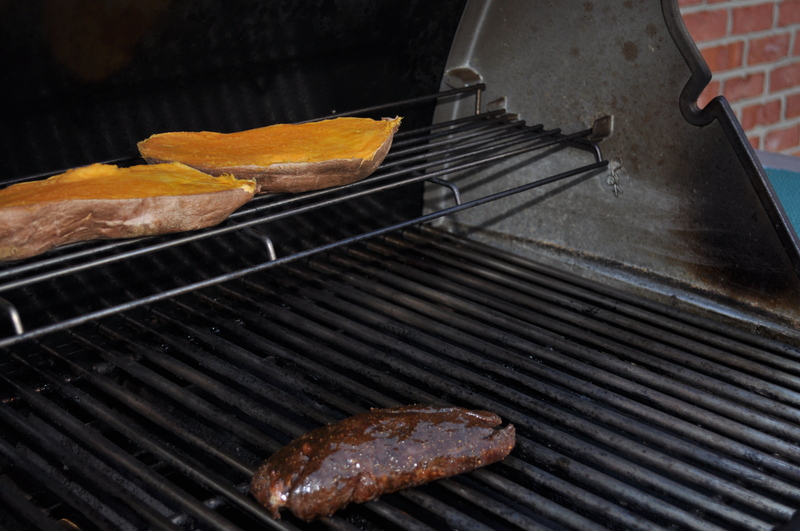 Perfectly cooked venison, not tough or gamey at all. It looks great, doesn’t it? 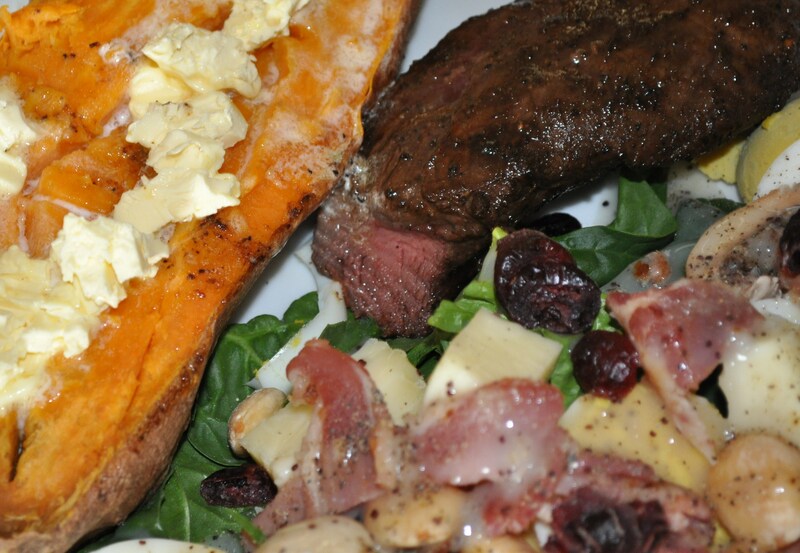 I will definitely use that web site again, for other venison recipes. As for the wine last night, I mentioned wanting to use a really good wine, and decided on a very old lovely Barboursville Octagon. From 1998, as a matter of fact. Luca Paschina makes exceptional wines near Charlottesville. And he is one of the sweetest people to talk to, we spent 15 minutes in a buffet line at RdV last fall talking about his winery and his love of Virginia, coming here from Piemonte to be the winemaker at Barboursville. 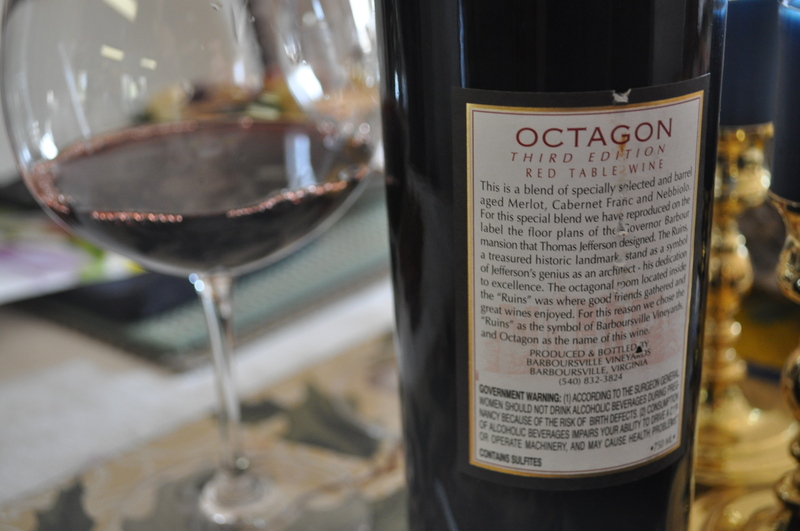 1998 was the vintage year for the third edition of Octagon. Beautiful wine, that stood up to the venison and had that smokiness that matches grilled food so well. You don’t have to buy imported wines, or food shipped halfway around the world to have first class meals. This weekend we celebrated the arrival of spring, using some of the best in the area. 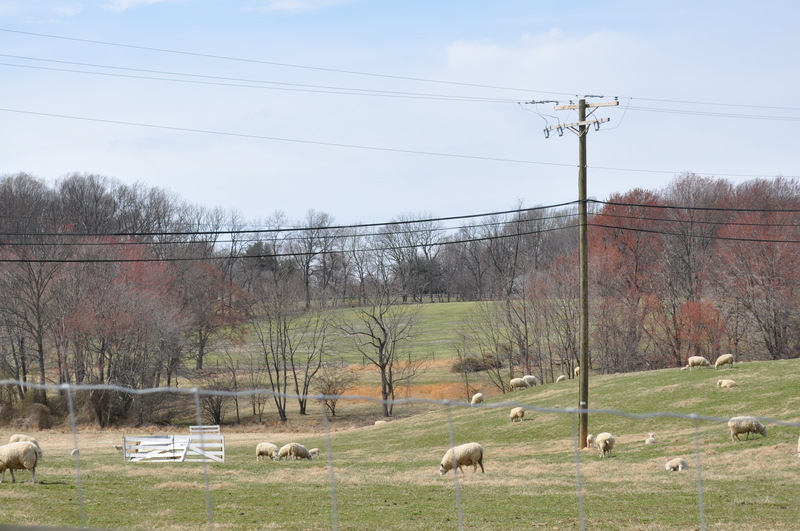 Posted in CSA, Farms, Food, Howard County, Local Businesses, Locavore, Real Food, Wine, Winter Eat Local and tagged cooking, farms, grilling, Howard County, local businesses, Locavore, real food, wine. Bookmark the permalink.